Researchers observed the melting of forsterite, the most common constituent of Earth's mantle, to understand how the cores of planets form and develop. The laser is able to create pressures representative of the extreme collisions between objects in space. The target is a 4 millimeter square. Al is aluminum and Qz is quartz. Credit: Toshimori Sekine, Hiroshima University. "Our results provide a better understanding how impact-generated magmas evolve and allow us to model Earth-type planets' inner structures. Collisions at these extreme temperatures and pressures created our own Earth and may have also formed the mantles of other Super Earth planets, for example CoRoT-7b and Kepler-10b," said Toshimori Sekine, Ph.D., first author of the research paper and Professor at Hiroshima University. These powerful collisions cause chemical reactions within the giant rocks and knowing what types of reactions occur under what conditions gives researchers a better understanding of the development of planets too far away for satellites to explore. Many of the rocks include forsterite, a representative mineral that makes up much of the matter in space. Forsterite, known to scientists as Mg2SiO4, is a combination of Magnesium, Silicone, and Oxygen and is the most abundant constituent of Earth's mantle, the layer between the surface crust and molten core. "The laser shock technique was first used in the 1990s, but the results were not precise. Recent technical advances enable us to measure precisely the laser-shocked states," said Sekine. 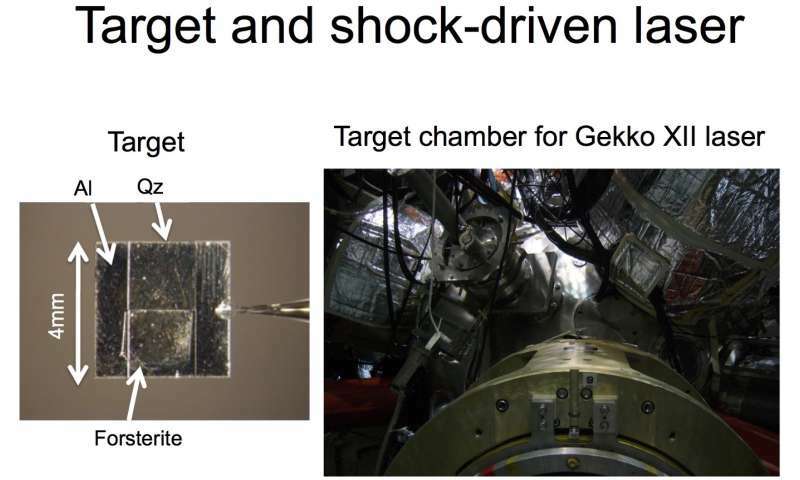 The laser shock technique uses a high-power laser to irradiate a target, which was a block of forsterite in the experiments by Sekine's team. The energy of the irradiation causes an abrupt expansion of the target's molecules and the inertia of this expansion generates a shock wave. The energy from the shock wave can create heat and light that melts and reflects off of the forsterite. Earlier research has connected magnesium oxide, one of the minerals that is formed from forsterite, to the reactions necessary for a planet to develop a magnetic field that persists for a long geological time, such as the magnetic field of Earth. With these new details of forsterite's melting behavior, researchers may be able to predict how minerals separate into different layers of magma and which minerals may be close enough to react. "Our results can support the possibility that violent, large-scale collisions between space bodies containing enough forsterite and moving faster than about 13 kilometers per second (8.1 miles per second) could lead to chemical layering in the mantels of massive terrestrial planets. Melting forsterite may have produced a sufficiently high concentration of magnesium oxide in early Earth's core to power a magnetic field around the planet," said Sekine.